TAMPA, Fla. (May 17, 2018) – As the sun goes down, the night comes alive at Busch Gardens Tampa Bay’s Summer Nights. New this year, the event starts earlier than ever on May 25. The event features extended hours, endless energy and world-class coasters that light up the night. Join in the summer conversation @BuschGardens with #ShowUsYourSummer and #BeerIsBack on Facebook, Twitter and Instagram and be the first to know about new events, special deals and future announcements by following the park’s blog. The company owns or licenses a portfolio of recognized brands including SeaWorld, Busch Gardens® and Sea Rescue®. Over its more than 50-year history, the company has built a diversified portfolio of 12 destination and regional theme parks that are grouped in key markets across the United States. The company’s theme parks feature a diverse array of rides, shows and other attractions with broad demographic appeal which deliver memorable experiences and a strong value proposition for its guests. 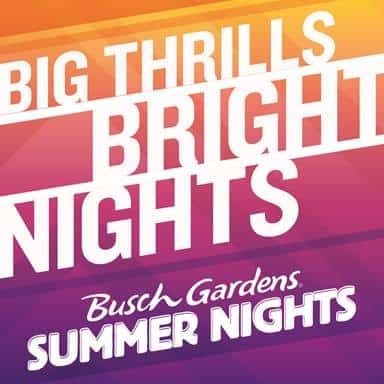 Get Tickets to Busch Gardens by CLICKING HERE!